Boston Celebration by Thomas Kinkade is available for sale on paper or canvas, framed or unframed at special discount prices. Select from the following authentic Thomas Kinkade editions: standard numbered, artist proof, gallery proof, examination proof, international proof, publisher proof, renaissance edition, studio proof, Atelier National edition, and masters edition. "Artists seek to present a distinctive vision of the world. Which means that there are favorite themes, color harmonies, subjects that repeat themselves in our work. In Boston Celebration, I make a virtue of necessity by returning to a favorite subject at a different time of day and year." Renaissance Editions are special reserved editions created with a textured brushstroke process that recreates the artist's actual brushwork. The canvas is then finished in oil by a master highlighter who applies a "Watermark Remarque" to the back side of the canvas. Each unique canvas is created under the artist's close supervision. Upon satisfactory completion, the artist hand signs the front of the canvas and a shiny, foil-stamped gold Renaissance Edition seal is applied to the back. Each Renaissance Edition is designated by the letters R/E after the print number. Due to the exclusivity of these rare pieces, all Renaissance Editions are limited to distribution through Thomas Kinkade Galleries and Signature Dealers. Studio Proofs are special reserved editions created with a textured brushstroke process that recreates the artist's actual brushwork. The canvas is then finished in oil by a master highlighter who also draws an original remarque on the back of the canvas. Each unique canvas is created under the artist's very close supervision. Upon satisfactory completion, the artist applies final highlights himself, and hand signs the front of the canvas in metallic ink. Finally, a foil-stamped gold Studio Proof seal is applied to the back. Each Studio Proof is designated by the letters S/P after the print number. Due to the exclusivity of this piece, all Studio Proofs are limited to distribution through Thomas Kinkade Galleries and Signature Dealers. Remember, if you find a lower price than what is listed on our website, you can fill out our free price quote form or call us to receive the lowest prices on sold out prints as well as new releases! 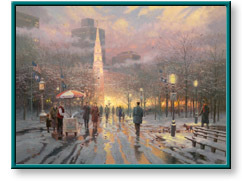 Boston Celebration painting by artist Thomas Kinkade (also spelled Thomas Kincade, Thomas Kincaid, or Thomas Kinkaid) can be purchased in art print or canvas form at special sale prices at Christ-Centered Art.